A depressed aluminum market dragged down first-half earnings at Rio Tinto, the global mining company, which paid no interim dividend in order to husband cash and cope with $39 billion in net debt. Rio, fresh from a $15.2 billion rights issue, recorded a $206 million loss before interest, tax, depreciation and amortization at its Rio Tinto Alcan aluminum unit, compared with an ebitda gain of $2.38 billion in the first half of 2008. The group’s 55 percent drop in pre-tax profits from $9.82 billion to $4.39 billion was in line with peers BHP Billiton, Anglo American, and Xstrata, all of which experienced the night-and-day difference between industrial metals prices in the first half of 2008 and 2009. 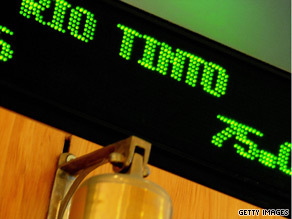 Rio shares rose 45 pence or almost 2 percent, to £23.56½ pence in morning trading in London. A drop in volumes and profits at Rio’s star iron ore division was dragged lower by the dead weight of the aluminum division. Rio is in the process of shutting some aluminum smelters permanently and others temporarily. This should take 12 percent of its total smelting capacity off line by the end of the year, which could support a price recovery because Alcan is one of the biggest aluminum makers in the world. Cost-cutting actions taken in the first half would reflect more fully in the second half, said Tom Albanese, chief executive. In the second half, a series of recently agreed asset sales also stands to lower net debt. Rio’s high net debt, the result of the $38 billion acquisition of Alcan in 2007, rose marginally from $37.8 billion to $39.1 billion. But net proceeds of $14.8 billion from its rights issue, completed after June 30, should slash this figure by the end of the year. Rio is the second-biggest iron ore producer in the world, and this important division recorded ebitda of $3.2 billion, down from $4.8 billion on lower spot iron ore prices. Overall, Rio sold 50 percent of its iron ore output on the spot market in 2009, reflecting the uncertain future of the benchmark iron ore pricing system. That system is at the center of a controversy that led to the arrest of four Rio employees in China in June, after Rio failed to agree with Chinese steelmakers a new benchmark iron ore price. The company made no mention of the arrests on Wednesday, but has said recently that the employees appear healthy and that it remains unaware of any evidence to support allegations that they improperly obtained trade secrets about the Chinese steel industry. Meanwhile the iron ore division has been producing close to maximum capacity in recent months, Rio said, at an annualized rate of 200 million tonnes. Rio is working toward a binding agreement with BHP Billiton, its main competitor, over a proposed operational combination of their iron ore assets in the Pilbara region of Australia. Rio paid no interim dividend, compared with a $0.55 interim dividend last year. “We expect that the total cash dividend for the 2010 financial year will be at least equal to the total cash dividend payment for 2008 of $1.75 billion, albeit over an increased number of shares, the company said.” Jan du Plessis, the new chairman, said, “We remain cautious about the recent rally in metals prices.” Interim earnings per share fell from $4.40 to $1.55, while revenues from continuing operations fell from $27.2 billion to $18.8 billion.